BoMuse News is a monthly newsletter from BoMuse Music. It presents items of interest related to jazz, and advocacy for music education, as well as news of releases from BoMuse Music and the performing activities of Paul Combs. Questions and comments should be sent by visiting “Contact” at Paul Combs’ Web-site. 1. 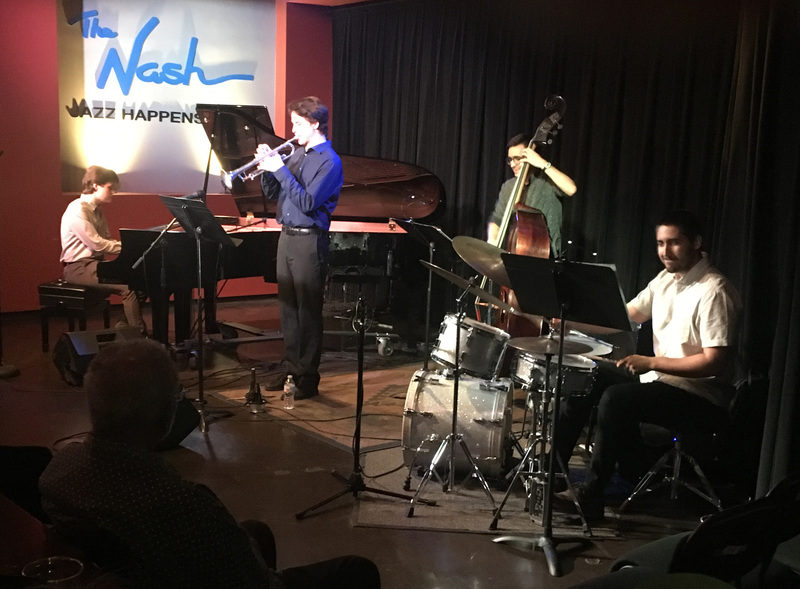 A group of young musicians took it upon themselves to present an evening of music by Tadd Dameron at The Nash in Phoenix, AZ, on Friday June 29. The bassist Max Beckman, an acquaintance, and now truly a friend, invited me to attend. Phoenix is just close enough for a one day drive, and I really did not want to miss this. One of my concerns in this entire effort to put Dameron in his proper place in the history of American music is reaching younger generations of musicians. The “ring leader” of this project, and featured artist of the evening, was pianist Ellis Green. As I understand it, he was drawn to Tadd’s music on his own. Max knows me through family friends, and knows of my research and book. For me this is a vindication, of both my own work, and the essential esthetic attractiveness of Dameron’s body of work, and it’s place in the development of what we know of as modern jazz. Joining Ellis and Max were drummer Filip Voia-Tipei, and in the second set, trumpeter Alex Price. The band did a fine job of both well known, and lesser known Dameron pieces. All are students or former students of the Herberger Institute for Design and the Arts School of Music at Arizona State University. 2. First, we have recorded all twelve of the pieces for The Unknown Dameron CD, and are moving on with sequencing, possibly re-recording a track or two, and then mastering. I have also started on the liner notes. It is hard to fix a release date as yet, but I do believe we will have this out sometime in 2019. Second, the excellent veteran vocalist Vanessa Rubin is soon to release her Dameron project. This one features songs by Tadd, backed by an octet, with arrangements by Frank Foster, Benny Golson, Jimmy Heath, and the late Willie “Face” Smith. She is in the final stages of creating the package, and I will, of course, let you know when it is available. I was a source for this project, which started with a concert at the Kennedy Center, a few years ago. I have been looking forward to this release for some time. Third, an all Dameron CD by a big band of musician/educators from the Cleveland area (well maybe Ohio and environs wold be more accurate) that was organized by Keith Englehardt and Steve Enos. Titled The Magic Continues, it is available from Tightenup Records. 3. While trying to track down a long lost musician friend, I was reacquainted with the Web-site All About Jazz. I had written a few articles for All About Jazz back in the nineties. As I devoted more and more time to writing my book on Tadd Dameron I lost my connection with this interesting site. There is just so much that demands the attention of an artist who is trying to manage a career by his or her self. As I signed up for a new account, up popped some things that had been in my profile from before, and the editor, Marc Ricci, welcomed me back. I can now be found on All About Jazz, and I reposted that article I wrote for BoMuse News on the demise of Ryles, in Cambridge MA. There is a nice video about this as well. I will be writing some more about the scene here in San Diego, as I have the chance. I am also re-establishing my musician page at All About Jazz. This along with a new page at Reverb Nation, and catching up with changes at CD Baby are a work in progress. I hope to have more to say on all this in the next issue. If you should visit me at Reverb Nation, you will find a track to listen to. It’s proper title is “Frank Fuller’s Waltz,” and was recorded on my CD Moon & Sand. This month Adam Wolff and I will return to La Mesa Wine Wine Works on Sunday July 8. I’ll be in the band with the Fred Hardy Quartet at Cafe Bar Europa on Thursday, July 19, and Dene Davidson Quartet at the Belching Beaver, in Vista, CA on Tuesday, July 24. The Dene Davidson Trio, with yours truly continues on Wednesday afternoons at the Carlsbad Village Faire, including July 4. All details can be found under Events at my Web-site.